Rounding is where the branched stellar snow crystals change shape into smaller more rounded shapes and the pores between the crystals get smaller. This is often observed as the settling of the snowpack making it more stable over time. The closer the temp is to 0c the faster this process is BUT, if it get colder the process slows proportional to the decrease in temp. Increased pressure from subsequent snowfall can accelerate the process. Faceting comes from large temperature gradients within the snowpack. A temperature gradient is simply how fast temperature changes over a certain distance within the snowpack. Why? Because it's a fact that warm air holds more water vapor than cold air. This means that temperature gradients also create "vapor pressure gradients" - more water vapor in one place than another. And what happens when you concentrate something - especially a gas? It wants to diffuse - move from areas of high concentration to areas of low concentration. When water vapor rapidly diffuses it changes rounded crystals into faceted ones - changes strong snow into weak snow. In other words: temperature gradients create potential weak layers that can kill us. That's why we pay so much attention to them. The point is that this is a completely reversible process. Strong gradient turns rounds to facets. Weak gradient turns facets back to rounds, the process in reverse. However, it occurs much more slowly because it takes so much more energy to create a faceted crystal and when we take the energy source away (the strong temperature gradient) it takes some time for the crystal to return to its equilibrium state (rounds). In other words, it might take a week or two of a strong temperature gradient to form large faceted crystals but after you take the temperature gradient away, it can take weeks or months for them to stabilize, depending on the ambient temperature of the snow and how much compressive load is on top. In cold climates without much load on top of the faceted snow, it may never gain much strength - even without a temperature gradient. The point here is: small temperature gradients make the snow stronger - large temperature gradients make the snow weaker. Got that? So, large temperature gradient - how large is large? For snow of an average snowpack temperature, say around -5 degrees C, the critical temperature gradient is about one degree centigrade per 10 centimeters (1 deg C / 10 cm). In cold snow, say colder than -10 deg. C you need a higher temperature gradient to cause faceting, and in warm snow you need slightly less. For example, let's stick two thermometers into a snowpit wall, one 10 centimeters above the other. Say we measure a difference of only 1/2 deg. C in 10 cm, it means that equilibrium snow is growing (snow is getting stronger). If we measure a temperature difference of 2 deg. C. in 10 cm, it means that faceted snow is growing (snow is getting weaker). All you have to do is to find a faceted layer in the snowpack, measure the gradient and you know whether the layer is gaining strength of loosing strength. This is a powerful forecasting tool. 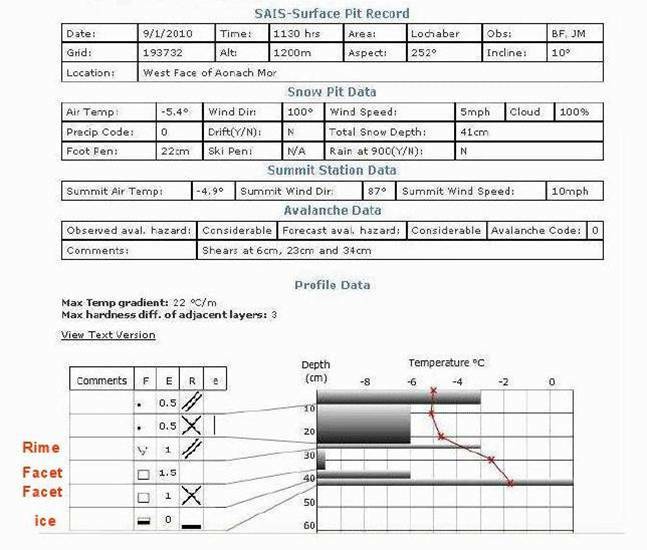 Ever wonder why the SAIS pit profile shows a red line giving the temperature profile of the crystal types and layers within the pit? Now you know!